In the long-running network show Supernatural (2005-), brothers Sam and Dean Winchester hunt demons and other supernatural creatures while road-tripping across the USA in their beloved ‘67 Chevy Impala. In the show, urban catastrophe is absent yet present: while Supernatural deals with themes connected to urbanity, these are transferred to the setting of rural as well as small-town America. So the almost classical fear of a fatal virus epidemic is here portrayed in the shape of a demonic virus hitting a small town. Similarly, a global apocalypse is averted in the location of a former battlefield on the rural outskirts of Lawrence, Kansas. This transferral is significant, since it apparently allows for the naturalization, standardization and the reaffirmation of whiteness as an identificatory marker of national significance. In Supernatural whiteness rules and this does not seem too unusual or grafted since statistics tell us that the Midwest and the South of the US, most commonly associated with rural areas and small towns, is the home of the largest percent of America’s white population (Hixon). In his book Affirmative Reaction, Hamilton Carroll addresses the so-called “white male injury” – an appeal to injury or plight in the face of shifting economic and sociocultural landscapes in contemporary USA that is a common feature among white men. At a time when the most important perceived threats to mankind in the US lie no longer without its borders, new threats are sought within the borders of one’s own nation. Carroll sees this in the reactive strategies employed by white US-American males facing “transformations in labor opportunity” that are being felt as “transformations in social opportunity,” to their disadvantage (Carroll 2). Supernatural’s protagonists are white, Christian, US-American males. But unlike the more traditional hero-vigilante-figures who guard big cities and who are privileged in social standing, the Winchesters come from America’s heartland: they are blue-collar Kansas boys, socially situated outside of mainstream society and yet emotionally situated firmly within the folds of a white American masculinity. Discussing the small town as a complex ideological form, Ryan Poll argues that it currently resurfaces in reaction to both, modernity and the globalizing U.S. empire, providing a new focus for yearnings for a geographic, cultural, and symbolic center of the nation (Poll 5-22). It is where the “nation’s authentic subjects can be found” (Poll 15). Yet any nostalgia that might be evoked by the Winchester brothers’ road-trip is obstructed by the visual representation of the country. According to series creator Eric Kripke it is “decrepit Americana,” where the “1950’s optimism has gone to seed … the look of this country but … ominous” (Williams). The world the brothers inhabit is one of seedy motels, grubby diners, abandoned buildings and empty stretches of land and the people they interact with are outsiders themselves or working- to lower-middle-class people. Studies of white masculinity speak of a “decline in traditional ‘masculine’ jobs [that] has led to a rise in insecurity in the American male psyche” (Carroll 4) The two young heroes of Supernatural, however, inhabit a world of traditional masculinity that doesn’t care for “chick-flick moments,” as Dean so eloquently puts it. According to Carroll the (“phantasmagoric”) “phenomenon” of white male injury, the claims of a crisis of masculinity in a changing cultural and economic climate, brings forth reactive strategies with which white masculinity aims to reclaim authority and privilege (2). Some of these can also be found in Supernatural. “As the normative ground of white masculinity erodes […] [it] turns to a reactive strategy under which it redefines the normative by citing itself as a marginal identity” (Carroll 6). In general, in the representations of whites, being white often functions as the human norm. This position of constructed neutrality can be gained because whites are usually not marked through race but are rather represented as gendered, sexed, classed etc. instead, thereby underscoring the claim that whites are “just the human race” (Dyer 3). In the shifting cultural climate, white masculinity then reacts by placing “itself in other identity locations (white trash, queer, blue-collar, Irish) in order to disavow that it is normative” (Carroll 7). The Winchesters are clearly classified as socially marginalized: forced by their profession to live apart from mainstream society, Sam and Dean support themselves through credit card scams and hustling and presumably the occasional odd job, since Dean is good at fixing cars. Through Kansas heritage, military training and their affinity to guns the boys serve as reminders of the age-old tradition of the Daniel-Boone-style backwoodsman (cf. “Daniel Boone as an Icon”), thus avoiding classification as ‘white trash’. They are smart, selfless and hard-working; they exhibit the core traits allowing hero-identification. There is the issue of class, however. Concerning class, Carroll observes: “As white becomes white trash it loses the stigma of privilege it previously held” (21). This is also the case with the Winchester brothers: As hunters they belong to an even lower class than that of white trash. As part of a scattered group of mostly socially reclusive individuals who spend their lives hunting down creatures whose existence is unknown to the general public, they are situated at the very edges of society. Through their association with the lower classes and their outsider position the “stigma” of whiteness might be said to be thereby lost as it diverts attention away from any attribution of race- and gender-based privilege (Carroll 21). However, the brothers’ marginal societal status only apparently denies (white male) privilege. From this position, according to Carroll, the same privilege can be easily recouped, by “citing itself as the most needy and the most worthy recipient of what it denies it already has” (6, 10). Aiming at broad audience identification, this showcases what Carroll calls “the celebratory attention given to blue-collar, working-class, and white trash masculinities” (20) in contemporary US culture. Supernatural’s small town setting – its treatment of the small town as the nutshell version and the ideological center of the nation – is consistently involved in a visual aesthetics of erosion, disrepair and depletion which allows viewers from various parts of the country to identify with the landscapes and the cityscapes of Supernatural even as they perceive that something is awry within the United States of America. The very classification that disavows privilege in Supernatural’s white male heroes ensures broad audience identification and reestablishes the ordinariness, the “just … human” as well as the authentic quality of unraced whiteness, thereby helping to redefine and reassert white masculinity’s normative status, albeit with a small difference of removing it to its last resort – rural and small town America. “Daniel Boone as an Icon.” American Eras. 1997. Encyclopedia.com. Web. 24 Jan. 2015. Carroll, Hamilton. Affirmative Reaction. New Formations of White Masculinity. Durham: Duke UP, 2011. Print. Hixon, Lindsay, Bradford B. Hepler, and Myoung Ouk Kim. The White Population: 2010. United States Census Bureau, September 2011. Web. 22 Sept. 2014. Ireland, Brian. 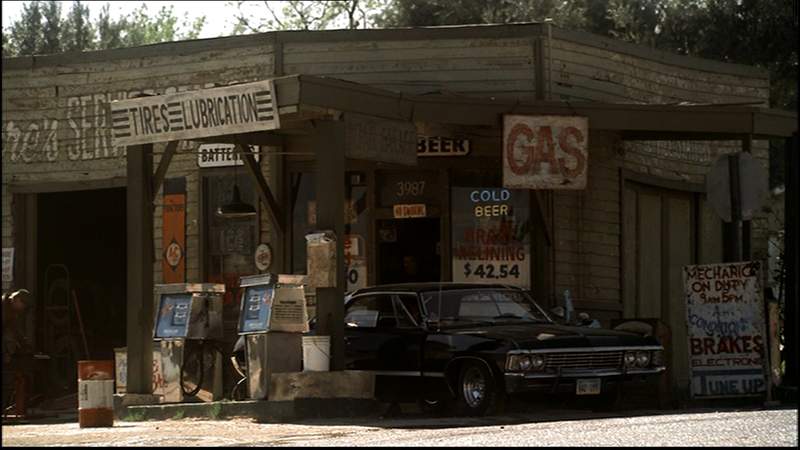 “‘All I Saw was Evil’: Supernatural’s Reactionary Road Trip.” American Studies Today Online. 5 Dec. 2013. Web. 6 June 2014. Poll, Ryan. Main Street and Empire: The Fictional Small Town in the Age of Globalization. Piscataway, NJ: Rutgers UP, 2012. Print. Williams, James A. “American Ghost Towns and the Anti-Apocalyptic Road Trip of Supernatural.” PopMatters. 20 Sept. 2010. Web. 6 June 2014. Wright, Julia M. “Latchkey Hero: Masculinity, Class and the Gothic in Eric Kripke’s Supernatural.” Genders 47 (2008). Web. 8 June 2014.